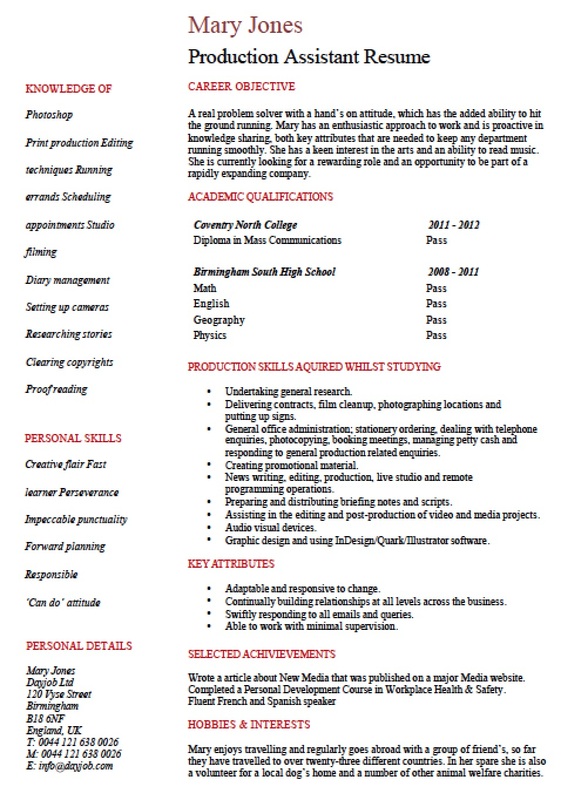 The entry-level production assistant resume template is generally for individuals with an undergraduate or masters degree with no real-world experience and seeking a position apart of a film crew. The project may be for any movie, documentary, or television project and the individual should recognize that as a newcomer that their position may be at the lower end of the scale. Due to the lack of experience in the field the applicant will most likely have to submit references to acknowledge that the person’s character is a good fit for a team film crew. Step 1 – Download the document and begin by replacing the sample with your own information starting with the header and typing your name. Step 2 – On the left-hand side of the page enter the any skills or knowledge of fields you have such as photoshop, print production, scheduling skills, filming, camera-handling, sound, setup, and any other related expertise. Step 3 – In the introduction to the resume you will write your objective. This is the main theme of your resume that will outline specifically what you would like to do if considered for the position. It should be a 3 to 5 sentence brief message of your goals as a production assistant. Step 4 – Write your academic qualifications including your grades at the university/college you attended. Step 5 – Enter your production skills such as if you worked on anything while in school or at any type of internship. This should be followed by your role(s) in those activities. Step 6 – In closing, write any affiliations with organizations/non-profit(s) and any references that you believe would help in obtaining the position.